The Moon Lantern Festival will light up Elder Park on Sunday. The main show in town this weekend is the OzAsia Festival, with the colourful Moon Lantern Festival in Elder Park, Night Noodle Markets, and a diverse line-up of music, theatre, dance, visual art and film. Other weekend events include the return of Lord of the Dance, the Bay to Birdwood Classic, the Italian Film Festival, a gig at The Gov by Sebastian Bach, and a showcase of Adelaide musical talent at Trinity Sessions in Goodwood. A highlight of OzAsia this weekend will be the free Moon Lantern Festival family event in Elder Park from 4pm to 8.30pm on Sunday. It will feature a lantern parade, roving performances, food trucks and a fireworks display over the River Torrens. OzAsia shows to check out include Indonesian dance performance Cry Jailolo, Teater Garasi’s contemporary immersive theatre work The Streets, performance artist Melati Suryodarmo’s 24,901 Miles and blues-folk-rock musicians Risky Summerbee & The Honeythief. The festival also incorporates a film program at the Mercury Cinema. See InDaily’s OzAsia Festival hub for all our reviews and stories. The Adelaide Festival Centre precinct is being transformed into an Asian hawker-style market for the 11 nights of the OzAsia Festival. Open on weekends from noon till late and on week days from 5pm till late, it will serve up street-food-style treats such as dumplings, pad Thai and dosa. There will also be bars and live music, and you can pop into the InDaily Lounge next to the main stage to write a fortune and share it on the Fortune Wall. Download a Night Noodle Markets map and menu Good Food Month website. Canadian singer and former Skid Row frontman Sebastian Bach is bringing his 18 And Live Down Under solo tour to The Governor Hindmarsh this Saturday. The show will include Skid Row hits such as “Slave to the Grind and “Youth Gone Wild”, as well as Bach’s solo tracks. Doors open at 7.30pm, with support by The Babes and Surviving Sharks. This latest show from Irish dance phenomenon Michael Flatley features 34 dancers, a score by composer Gerard Fahy, new choreography, and technology including holographs and dancing robots. In Australia as part of a 15-country tour, it’s at the Adelaide Entertainment Centre until September 27. Read InDaily’s review here. Dancers from the ADT will be entertaining members of the public with a pop-up performance in Victoria Square between midday and 4pm today (Friday). 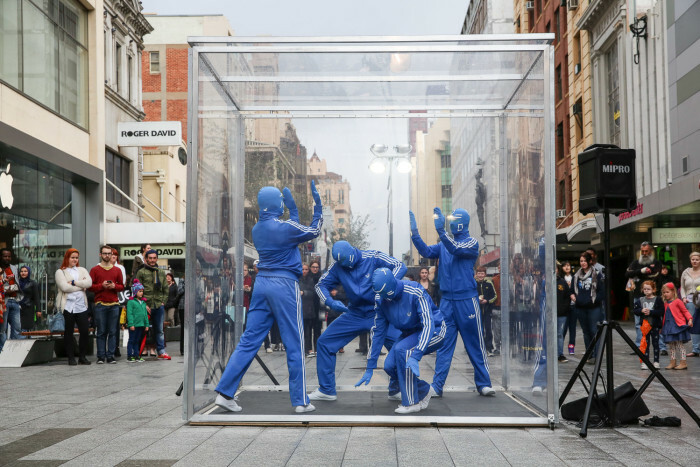 They will perform within a large perspex cube known as the Ice Cube, offering 360 degree views of the dance. The ADT is this year celebrating its 50th anniversary, and will also be running street dancing workshops for teenagers at the Adelaide Meeting Hall next month (details here). Comedy, drama, romance, crime, fantasy and documentary films will be screened throughout the Italian Film Festival season at Palace Nova Eastend Cinemas until October 7. This weekend’s films include the comedy-drama Mia Madre (My Mother); the documentary Italy in a Day, by Oscar-award-winning director Gabriele Salvatores (Mediterraneo) and Palm d’Or-nominated fantasy film Tale of Tales. All session times are online. Following the premiere of her new work 24,901 Miles, commissioned by the OzAsia Festival, Indonesian performance artist Melati Suryodarmo will discuss her art in a free presentation at the Art Gallery of SA’s Radford Auditorium at 2pm on Sunday (details here). Currently showing at the gallery is Riverland, a survey exhibition of works by master Ngarrindjeri weaver and artist Yvonne Koolmatrie; The Power of Pattern: The Ayako Mitsui Collection, which explores Japanese textile design; and Gond Paintings from the Collection of Barrie and Judith Heaven, showcasing the brightly coloured art of the Gond people of central India. Details of all exhibitions can be found here. A triple bill of Adelaide acts traversing the genres of folk, alt-garage, pop, country, blues and soul are being presented this Sunday at the Trinity Sessions, held in the old Church of the Trinity on Goodwood Road. 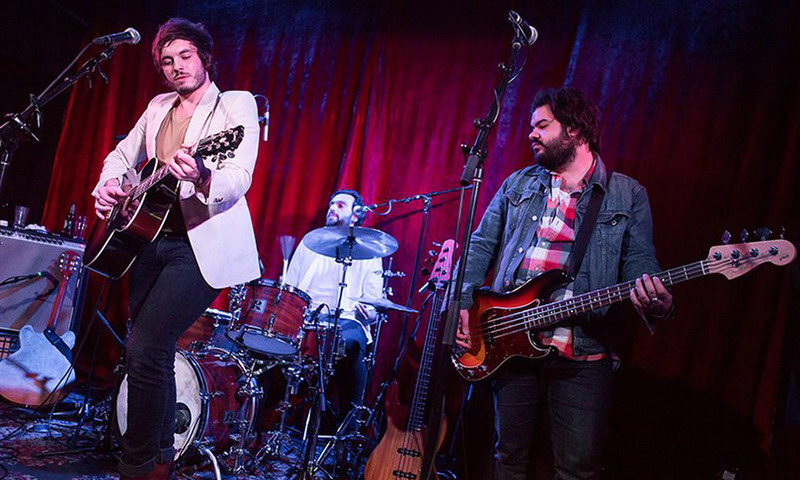 Beginning at 5pm, the line-up comprises singer-songwriter Kelly Menhennett and band, Max Savage and the False Idols and Cosmo Thundercat (pictured above). Details here. These two Melbourne bands have teamed up for a mini national tour and will play two gigs at West End pub the Worldsend tonight (Friday) and Saturday night. Long Holiday, who have recently released a new single, play “high-energy punk/grunge-dominated songs”, while Two Headed Dog describe their sound as “adrenaline-triggered, fuzz-laden, 1970s-inspired” jams taking cues from groups such as Creedence Clearwater Revival and The Doors. This theatre adaptation of Nick Earl’s novel Zigzag Street follows six weeks in the life of 28-year-old Richard, who is wallowing in misery in his late grandparents’ house after his girlfriend left him. Stirling Players’ production of the comedy is being directed by Miriam Keane and is playing at the Stirling Community Theatre until October 10. How far will an actor go to get a part? That’s the question posed in this new play directed by Joh Hartog and being presented at the Bakehouse Theatre until October 3. The Audition centres on a no-holds-barred struggle – or “bootcamp audition” – between director Stella and budding actor Lauren during an all-day process that stretches Lauren’s mental, physical, emotional and ethical limits. Review here. Subtitled Save the Red, Save the Planet, this cabaret show by SA playwright Michèle Saint-Yves and singer/songwriter Izzy Jane takes audiences on a journey through the history of women blessed with red hair. #KickAssREDS is at the Rhino Room until September 29. Review here.